Rivalry between the forces of two different planes of Hell – Hades and Dyval – has turned into all-out war. A war that spreads across the Megaverse like a cancer. Countless worlds and entire galaxies are caught in the crossfire and face invasion or outright destruction. For some worlds – your world – Armageddon looms. Can your heroes save the Earth? They’d better, because you and your entire world are expendable playing pieces in the mad game of vengeance and destruction between demons and Deevils. Armageddon Unlimited™ is more than an epic, world-saving adventure, it is also a sourcebook jam-packed with new powers, magic, weapons and Power Categories that can be incorporated into any Heroes Unlimited™ campaign. 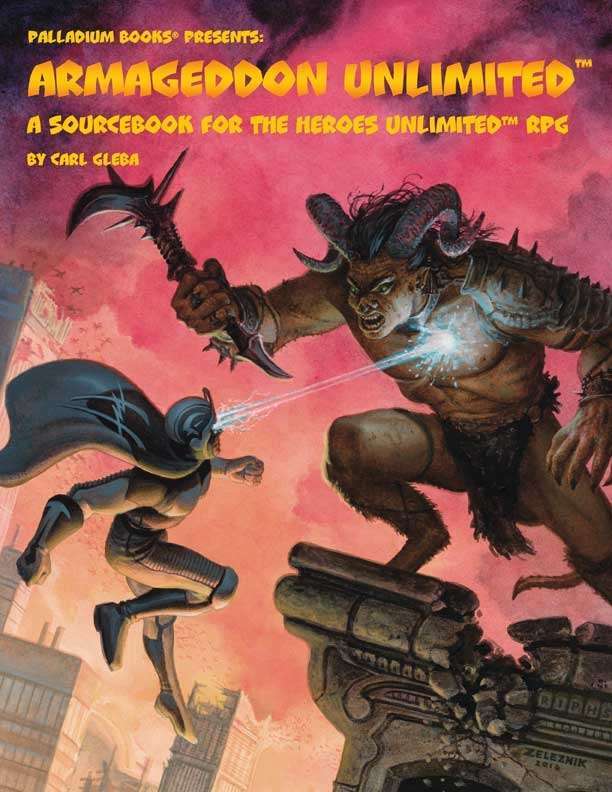 This book can be used as a standalone adventure sourcebook for Heroes Unlimited™ or as a pivotal plot in an expansive Minion War™ campaign. 7 new Minor Super Abilities. 15 new Major Super Abilities. 15 new magic weapons and objects. Hellion monster creation table and nearly two dozen NPC villains. Magically Bestowed Variant Power Categories. The secret island base of Doctor Vilde and maps. More than a dozen NPC villains, adventure and more. 160 pages – by Carl Gleba and Kevin Siembieda.